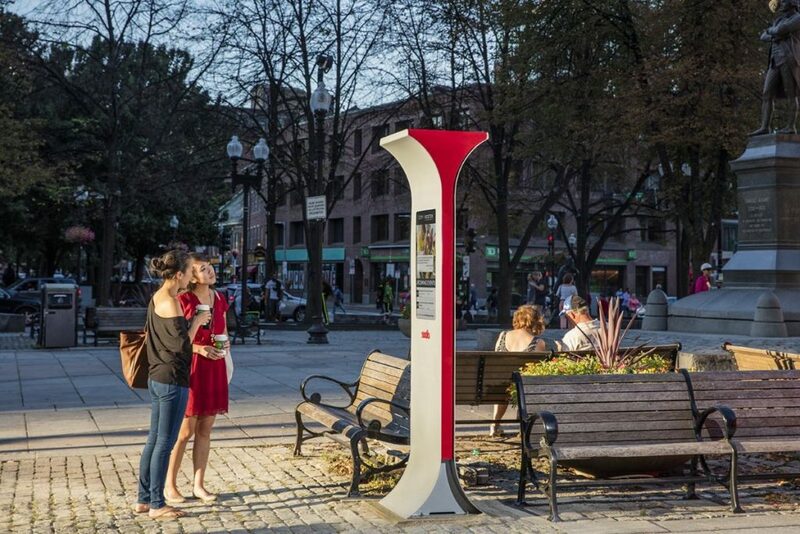 Soofa, a spinoff of MIT, has joined forces with Visionect to activate public spaces in Boston. The result is the Soofa Sign, the bulletin board of the 21st century. The solar-powered smart urban furniture uses electronic paper to share information with the local community, contributing to the city’s sustainability goals. All this achieved by just four bolts. The City of Boston is on a roll, using advanced technology to respond to the challenges of 21st century living. With more than 54 percent of the world’s population now living in urban centers, the Massachusetts capital is taking steps to provide a welcoming and sustainable space for all, fully aware that successful smart city infrastructure consists of more than just roads. 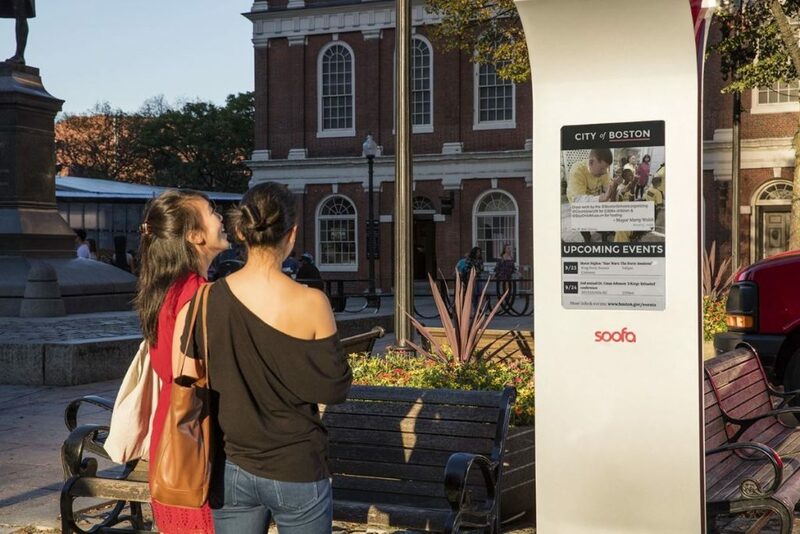 The Soofa Sign runs on solar-powered electronic paper and provides real-time information on local events and City services at Boston’s pedestrian epicenter, Samuel Adams Park, located outside of Faneuil Hall. Advancing all aspects of city services, Boston is turning the page through a series of civic improvements, the latest of which is the most advanced in urban street furniture: the Soofa Sign. Developed by Soofa, a spin-off of the MIT Media Lab, and running on Visionect technology, the Soofa Sign is the newest product in Soofa’s smart urban furniture ecosystem, following the success of the Soofa Bench, the first to push the boundaries on public infrastructure. “The addition of this sign in one of the most historical places in our city is just one more step towards making Boston more welcoming for all who visit,” said Boston Mayor Marty Walsh on unveiling the Soofa Sign in Samuel Adams Park. The Soofa Sign is designed to be loved by the public and easy to install for cities and developers in previously impossible or unimaginable applications and environments. Intuitive to use, the Sign runs on solar-powered electronic paper and provides real-time information on local events and City services at Boston’s pedestrian epicenter, Samuel Adams Park, located outside of Faneuil Hall. A plug and play solution, the Soofa Sign can be installed anywhere under the sun with just four bolts fixing the sign in place. Solar-powered, Visionect’s advanced signage technology enables the e-paper screen to be extremely energy efficient. A plug and play solution, the Soofa Sign can be placed anywhere under the sun, reaching all residents through technology implementable even in the most demanding of locations. All it takes to install this smart urban display are four bolts fixing the sign in place – no access to the power grid or complex machinery necessary. This makes the Soofa Sign a vitally important component of the new model for the Smart City, where the focus is using technology to improve the quality of life for every single citizen. The Soofa Sign’s elegant form, energy-saving properties and light environmental footprint allows it to stand gracefully among the historic statues and buildings in Faneuil Hall as well as in a quiet residential neighborhood. This versatility of use is made possible only with the most advanced technology platform. The Soofa Sign is made up of a color 32-inch E Ink® electronic paper display and is powered by Visionect’s advanced signage technology, which allows the e-paper screen to use up as little energy as possible and seamlessly update the sign with real-time content. The result is an extremely durable, low power outdoor sign that is self-powered by a solar cell, has great visibility in adverse light conditions and connects via 3G to receive real-time content updates, all without any light pollution whatsoever. A companion to the Visionect-powered wayfinding sign unveiled on City Hall Plaza in July, the Soofa Sign encourages Boston’s visitors and residents to engage with each other and the city. Co-developed with the Boston Mayor’s Office of New Urban Mechanics, the sign displays content that is most important for a particular location or neighborhood, bringing the public and government closer together and enabling real-time neighborhood communication. 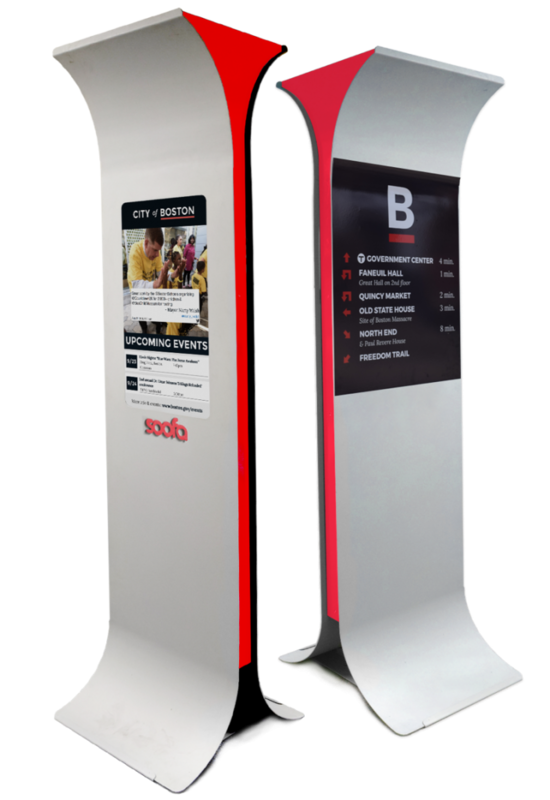 Focused toward delivering community content, Soofa Sign displays will show a mix of municipal information, transit updates, advertising for businesses operating within a general proximity of the installed sign and citizens’ input. Currently showing Mayor Walsh’s Twitter feed and upcoming events in Boston, the goal of Soofa and Visionect is to improve the quality of life for people by providing easily accessible information at the right time. Engaging citizens, the signs will also help city leaders make more informed decisions. Following the launch in Boston, the Soofa Sign will soon be in Cambridge, MA and select cities across the United States.